Pinot Noir as a wine came along okay, then turned to vinegar. My own shiraz is softer, and fuller than the Longford, so I don't know whether to blend it or not. 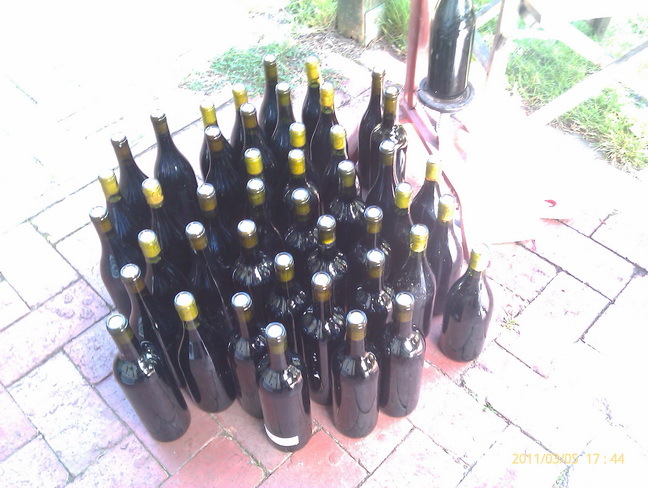 This year (well- 2009)I learnt by January 2010 that we started with at least chardonnay bushes, pinot-noir bushes, and 15 shiraz in the portable section of the vineyard, and the usual 6 Old Shiraz and the Foxy Grapes Garage bushes. Pruning in 2008 and 2007 gave 9 bushes in starter pots, from about 100 cuttings. Last years pruning gave me only three new cuttings from 60... Too late, should have planted much earlier- like late July or August, not mid September after the budburst on the rest of the yard. The irrigation method is now to fill saucers beneath the pots (new idea) about 2 or 3 litres, and on hot days to also fill up a 2 litre plastic bottle in the top of the pot( upended with the bottom cut off). The 800 litre water tank that takes runoff from Alex's shed is too hard to get going, and monitor- as is crowded. New thought is to put the irrigation hose past the 'saucers' instead of into the top? On 2 March 2010- picked the "garage aromatic grapes" or Foxy grapes; at 22 brix- should have waited, not a great wine anyway, and not to 30 brix, will note this for next year. 22 kilograms, lovely day, picked at 10.30am, crushed at 12.30pm, pressed at 1.00pm. 11 litres Juice at 1085 sg after "first pressing" so may get an even dozen bottles, or 3 liters of a brandy! 20 litres pomace production too- of skins, twigs and some juice, for Brandy making. 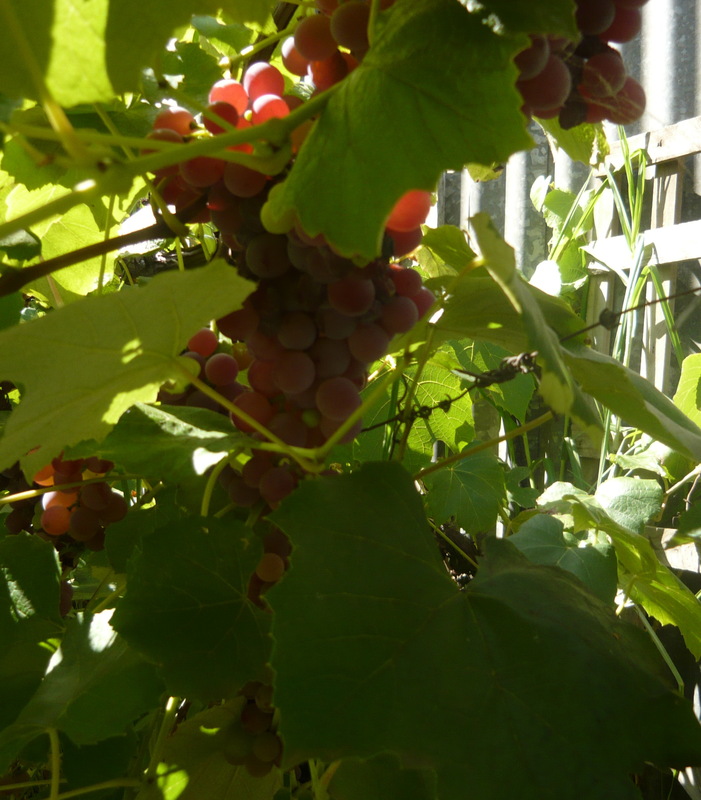 its the garage grape- very aromatic, slightly off sort of nose, will keep some juice to sweeten it up if it turns out okay- like a Traminer or porphyry sauterne- sweetish anyway. The Pomace Wine was bloody awful- at less than 10%- into the still! From Alistair and Catherine Hicks, Upper Maffra West, near the Glenmaggie Weir, 4/Mar/10. Approx 4 buckets crushed from the morning pickings gave 24.5 litres juice, and a 30 litre pomace. Brix was 23 today, or 12.5 Baume (yesterday). Crushed and pressed, 1105 sg, not bad! First time with this grape variety, will see how we go. The blurb on the Blue Gables label of Alistair’s 2009 vintage says fermented and matured via young oak barrels- so will add some oak chips while it ferments. Added ¼ teaspoons of DAP/Malic/Citric/Oxalic acids per litre to must, and 6 crushed Camden tablets as I want to use a commercial yeast strain, not wild. Hope to thro the yeast tomorrow before we go to OG. The pomace, with stems and skins and wash downs, like the old Foxy Garage Grape Pomace- Natural Yeasts to get them going, may taste horrible, but may also get to 'still' it. So, the pomace wine was bloody awful- dad tasted it to confirm, I warned him! Into the Still with it. 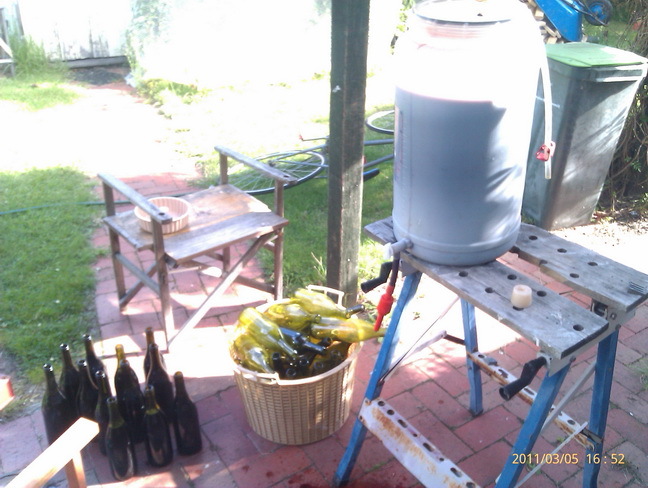 The wine proceeded to ferment, I put some bentonite in it 18-3-10 to settle the floaties. It smells like a wine, looks a little bit brown rather than yellow, and tastes okay. Hopefully there was not too much bentonite. picked at 24 brix. Lost up to 10% , made up 2 litres juice and skins. Will let ferment naturally. well, I thought it fermented out in the little jar- but being a pickekled onion jar- guess what?- The Pinot was very volatile! Because it was vinegar!! Went on to use it at The Ghurk anyway and nearly finished by August- really nice in all sorts of meals. Glad it went that way now. When the Foxy grapes were 21 brix and picked, so were a few Shiraz grapes- panic! Then realised need a bit more time though, I want 1.1-1.3sg or 30 brix. 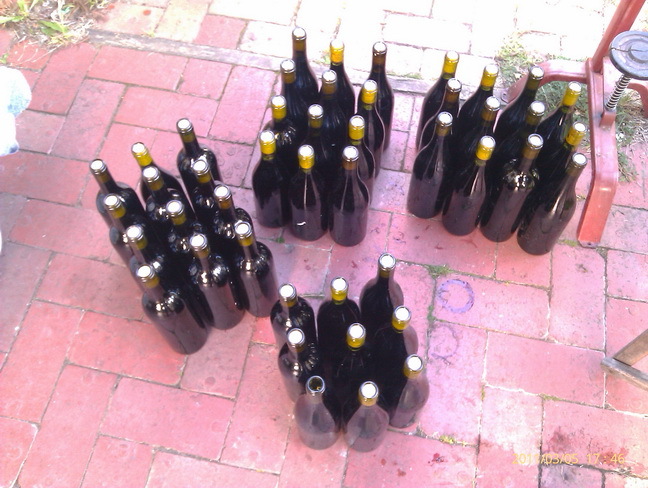 Picked 21 March as was going to lose a lot- only got 7.5kg Shiraz juice- just like last year! Think probably lost nearly 50% of the potted vines. Wasn't quite ripe enough at 25 brix, but losing a lot- dried out /slowly rotting berries- had to harvest before lost the rest. The planted vines were much better off- the fruit beautiful, a little bit spicey as required, not very blackberryish at all. So SMSed the must- hopefully will not get vinegar from this lot!! Threw yeast Monday- with a dash of orange juice. Fingers crossed. Have processed about 5litres plus, so should have half a dozen bottles this time next year. The fermentation went well, and it tastes good. Maybe have to use a insect spray more often next year- the dried husks are either insect derived or sun burnt- or need to keep up water, not just think that the rain fall will help. And not reduce the canopy so much- in fact try to get it up and evenly spread higher over the whole lot- too much sunlight on the 'north side' vines. Citronella to keep bees and wasps away? By July, seems to be okay. Racked off 29 July, tasted good, added some KMS. Moved inside to start a Malic Lactic fermentation. The Golden --- Apple tree produced a nice yield this summer but the birds and the girls got to it...However, I have managed to save some of the new apples from the Cider Apple tree, and one day, they can be defrosted. plum tree and Loquat Trees were plentiful, but not utilised this year. This year, besides the Bundy Oil Concoction, Limonella was attempted again with 80-90% pure additions to the Zest of 18 lemons. Amount was 1.5 litres. Some was lost to tasting... In the end, we have enough, and a liqueur was made with 150 grams water and 150 grams sugar added to 300 cl limonella for an initial batch. Nice. Other native oil products were Bundy types- which are always noice.